What happens when two Christian women, one a writer and the other a photographer, go in search of the seven ancient cities mentioned in Revelation? 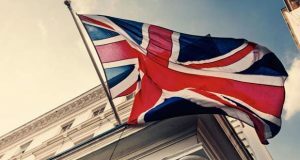 Find out what they discovered and the lessons those churches are still teaching Christians today. Not long ago, I didn’t know that the Seven Churches of Revelation were all located in modern-day Turkey. Don’t get me wrong. They were beautiful rocks. But they were rocks, ruins of ancient cities once teeming with people long gone. In the apostle John’s vision of Revelation, Jesus spoke to the Christians in these cities, commending some but warning most. In reading Jesus’ words to the seven churches and learning about each location, I wondered how these rocks should change my life. 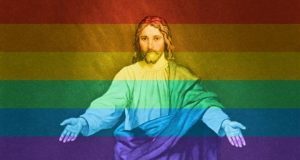 In Revelation, Jesus commended the Ephesian church for enduring hardships and hating the heresy of the Nicolaitans — early Gnostics who wanted to blend Christianity with pagan practices like sexual immorality. But others in Ephesus had fallen from their first love of Christ and received a sober warning: “Repent and do the things you did at first” (Revelation 2:5 NIV). Some scholars think these Christians may have caved to pressure to worship at the cult temple of Emperor Domitian. 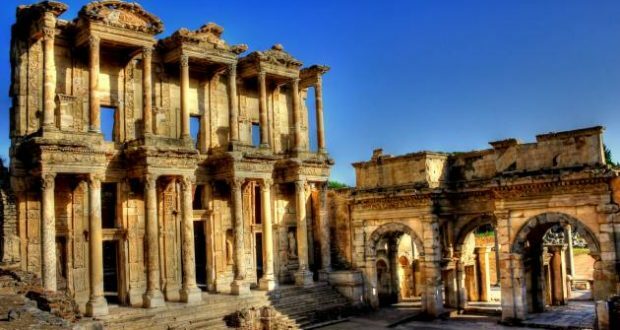 Over time, Ephesus physically shifted to what is now the small town of Selçuk, only a five-minute drive from the Ephesus ruins. Honeysuckle perfumed the air around the shops and streets I visited. The town is Muslim — as is 99 percent of Turkey. Even so, a small Protestant church of former Muslim believers gathers in Selçuk for worship and fellowship. 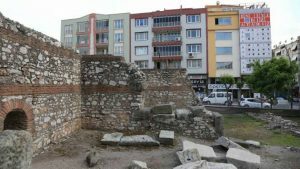 The ruins of Smyrna’s marketplace are nestled in a city block of the thriving seaport city Izmir. One of the oldest continuously inhabited cities of the world, Izmir is now home to more than 4 million people. When we pulled up to the ruins of ancient Smyrna’s marketplace, high school students spilled out from their school. They seemed ambivalent to the millennia-old city ruins across the street from them. Jesus’ words to the believers in Smyrna encouraged them in the face of coming persecution. “Be faithful, even to the point of death, and I will give you life as your victor’s crown” (Revelation 2:10). Indeed, not just in Smyrna but across the entire region, first-century believers who resisted the pressure of imperial cult worship endured persecution. Some scholars think this persecution was often economic, like the loss of a job or financial wealth (1). Probably for this reason, Jesus reminded them they are spiritually rich even though materially poor. The early church father Polycarp was the bishop of Smyrna and a disciple of the apostle John. At the age of 86, he was burned at the stake for refusing to renounce his faith in Christ. Some of Polycarp’s last words were, “For 86 years I have been his servant, and he has done me no wrong. 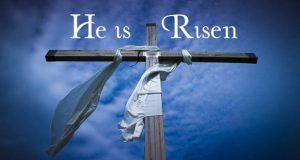 How can I blaspheme my King who saved me?” (2). 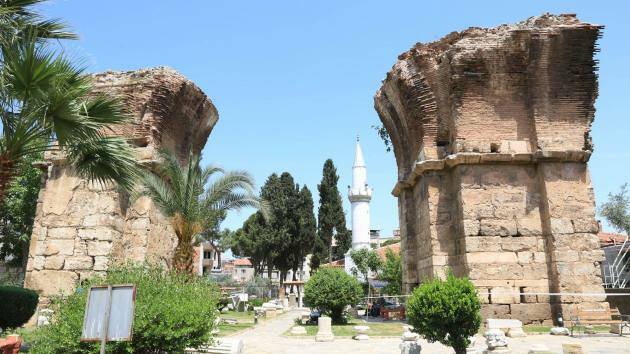 The modern city of Izmir is filled with secular modernists — officially Muslim by name but sincerely disillusioned with Islam and the current political climate. They may know that Christians “used to” live in Izmir but most are unaware of the thriving Christian community of up to 500 believers scattered among at least 12 churches. Although many of these churches are historically Catholic or Orthodox, there is a growing number of evangelical Protestant believers as well. But it was the ruins of the temple to Zeus that sobered me. 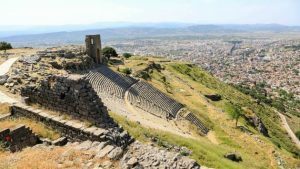 Some think this temple is why Jesus called Pergamum the place where Satan has his throne. Jesus had some serious warnings toward Christians in Pergamum who had fallen away from His teaching to embrace sinful behaviors. If they did not repent, Jesus Himself would come and fight against them. Jesus did, however, commend the few in Pergamum who stood strong and didn’t renounce their faith even when their friend Antipas was killed (Revelation 2:13). Today, Bergama is made up of an “old city” of narrow cobbled streets and a more modern city. The locals I interacted with didn’t disappoint as they extended their famous Turkish hospitality. Happy to offer information, one man told me Christians visit the seven churches like Muslims visit Mecca — to earn merit before God. My heart dropped to hear his misunderstanding of Christianity. Today, there are a few known believers around Bergama, but no churches. In the book of Acts, Lydia was a wealthy benefactress and convert to Christianity. 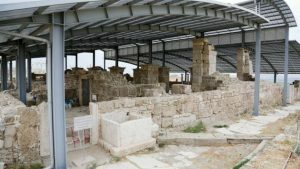 A seller of purple cloth, Lydia’s original home was the city of Thyatira. The ancient coins of Thyatira show a multitude of guilds including linen weavers, bronze workers, potters and bakers. Thyatira was the only city of the Seven Churches built on flat ground without natural defenses, making it vulnerable to attack. In John’s vision, Jesus is described with feet like burnished bronze — a metaphor Thyatira citizens would have easily grasped because of its bronze workers. Jesus warned those in Thyatira who were tolerating the deceptive teaching of “Jezebel,” an unrepentant influencer or perhaps a symbol for the licentiousness that led people into Satan’s “deep secrets” (Revelation 2:20,24). Few in Thyatira had remained true to the faith, and Jesus encouraged them to “hold on” (Revelation. 2:25). He promised authority over nations to those who persevere until the end. 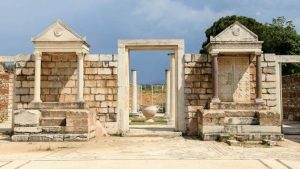 The Jewish synagogue in ancient Sardis was in use for up to 600 years. Today, the town of Sart has nearly 5,000 residents — with no known followers of Christ. We parked our car — the only vehicle in the gravel lot at the ruins of Sardis — and climbed out to view the extensive excavations. The legendary wealthy King Croesus, who amassed gold from a nearby river, reigned from Sardis in the 500s BC. 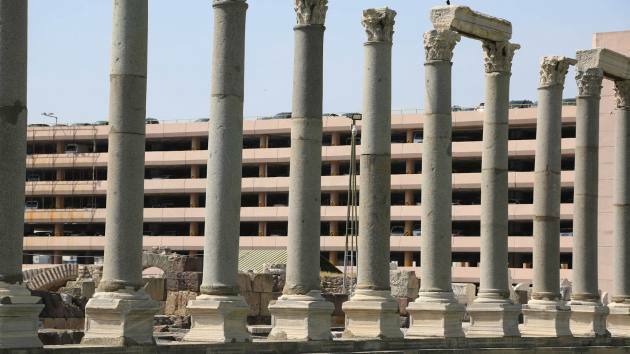 Ruins from the Temple of Artemis — originally dating from the fifth century BC and rebuilt by Alexander the Great 100 years later — still stand today. A stadium, shops and ruins of the largest ancient Jewish synagogue in the world, which was in use for up to 600 years, were a short jaunt from the temple. At the time of John’s vision in Revelation, Sardis was one of the wealthiest Roman cities despite having been rebuilt multiple times after devastating earthquakes. Jesus’s words in Revelation sliced through Sardis’s thriving “health” to the church’s spiritual realities. Although there were a faithful few, most people in the Sardis church were spiritually dead and dying. Christ summoned them to “wake up,” “remember,” and “repent” (Revelation 3:2–3). Ruins from a small, fourth-century Byzantine church stand on the grounds of the Temple of Artemis. I found the crumbling church — built a few hundred years after John’s letter — to be a hopeful sign that some in Sardis took the warning to repent. The modern town of Sart — only a mile from the ruins — has just over 5,000 inhabitants. A nearby village, adjacent to the ruins, carries on with rural life. Children run in the dusty streets. Farmers drive tractors into the surrounding fields. There are no known Christians in Sart today. Little remains from ancient Philadelphia, the city of brotherly love now called Alaşehir, the “city of Allah.” Not established until the mid-100s BC, the city of Philadelphia was the newest of churches Jesus addressed in Revelation. The modern city of Alaşehir stands on top of Philadelphia. You have to look carefully to find any signs of the city’s former life. Crumbling Byzantine walls blend into its cityscape. 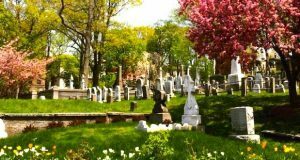 One neighborhood has preserved the arches and sarcophagi (decorated stone coffins) from a sixth-century church. The call to prayer from the adjacent mosque interrupted our perusal of the sparse ruins. I felt uncomfortable with a spiritual weight in Alaşehir. I tried to reconcile that feeling with the knowledge that this is where faithful believers were praised by Jesus, who said, “I know that you have little strength, yet you have kept my word and have not denied my name” (Revelation 3:8 NIV). The churches in Hierapolis, Colossae and Laodicea were relatively close and seemed to have a relationship with one other. The apostle Paul instructed that his letter to the Colossians be read also in Laodicea (Colossians 4:16) and he was encouraged by their strong faith in Christ (Colossians 2:5). 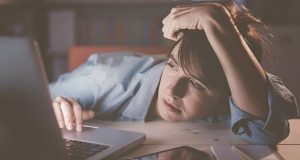 Something seems to have changed, however, in the 30 years after Paul’s letter when John penned the book of Revelation. Wealth and independence had weakened their commitment to Christ. In Revelation 3, Jesus used language and imagery familiar to them: riches, eye medicine, white clothing and tepid water. He said, “I know your deeds, that you are neither cold nor hot. I wish you were either one or the other! So, because you are lukewarm — neither hot nor cold — I am about to spit you out of my mouth. You say, ‘I am rich; I have acquired wealth and do not need a thing.’ But you do not realize that you are wretched, pitiful, poor, blind and naked” (Revelation 3:15–17). In the subsequent days after our trip, I’ve processed a few lessons to learn from these ancient ruins and from the letters to the seven churches. Jesus couldn’t make it any clearer: following Him requires our all. The believers of the first century felt the constant social pressure to compromise their faith by worshiping the emperor in cult worship, tolerating false teachers, and leading lifestyles that mirrored the pagan world around them. The Christian life is one of mountains and valleys. If we don’t keep a long-term perspective, we will become quickly discouraged and fall away. Christ speaks often of endurance in His letters to the churches. “Be faithful until death,” He encouraged the church in Smyrna. Those who endure to the end are called victors and will share in Christ’s glory (Revelation 3:21). Let’s take heart from the faithful examples of those who have gone before us and persevere in fidelity to Christ until our final breath. The people of Turkey are not the same ethnic people of the first century. A Muslim people, Turks are proud of their final overthrow of the Christian Byzantine Empire in 1453. Yet God’s church is growing. 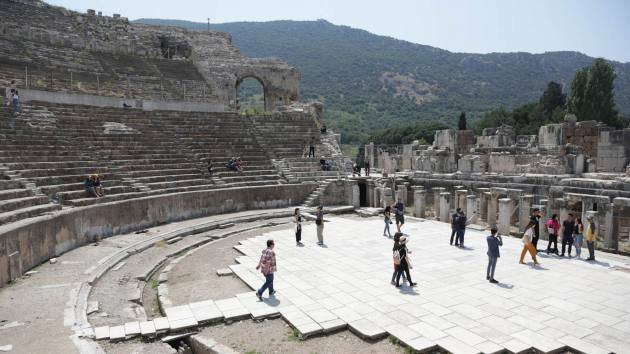 Throughout the many small towns like Bergama scattered across Turkey, men and women are searching for God. In 2017, nearly 10,000 individuals answered an ad to receive a New Testament in the mail. God is raising up His church in this ancient land. Many of the ruins we visited were desolate. It was just my coworker, me and the lizards among the ancient stones. I remembered Jesus’ words to the Pharisees who wanted Him to rebuke those who cried, “Blessed is the King who comes in the name of the Lord!” Jesus told them, “If they keep quiet, the stones will cry out” (Luke 19:38,40). And so they do. Even stones built for pagan worship cry out that Jesus is King. He is building His church, and I want Him to find me — find us — faithful in the end. (2) “Biblical Turkey: A Guide to the Jewish and Christian Sites of Asia Minor” by Mark Wilson, p. 311. — “Biblical Sites in Turkey” by Everett C. Blake and Anna G. Edmonds.